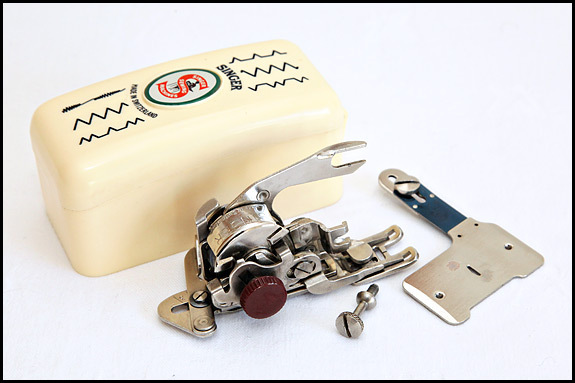 If you’ve been hankering after a Singer Swiss Zigzagger 160990, permit me to direct your attention to the one I just listed on our Bits ‘n’ Bobs page. It works a treat, and cosmetically both the attachment and its case are excellent. However, the feed cover plate (which is the correct one!) has lost its chrome in a small area as can be seen in the picture to the left of the central slot (the smudge to the right of that slot is a greasy fingermark! ), and this one comes without instructions or the cams needed for the fancy stitches. Having said that, the Swiss zigzagger does a very nice variable-width zigzag stitch with just the built-in cam, the instructions are on the interweb, and this one’s listed now at about half the price it would be with cams and book of words. If all goes well, the next post should be all about the 1933 Singer Illustrated Catalogue and Price List which Syd was kind enough to leave with me for scanning when he and Carol came to pick up some stuff from us on Thursday. As they drove off, it occurred to us that in another week or so, we’ll have been carless now for three months – and the only time we’ve really noticed was when I had a hospital appointment which meant a bus trip there and back! It would probably be interesting to work out how much money that’s saved us so far, but … erm … neither of us can be bothered to do the calculations. I can though tell you that it looks like by the time we’ve had our electric bikes a year, I’ll have done well over 1500 miles on mine. And that leaves us with the seven types of home-grown organic salad crop which Elsie announced were on her plate at lunchtime today. There was lettuce (A foglia di quercia, since you asked – cheap seed from Lidl), American Cress, Mizuna, Green In Snow, Komatsuna, Southern Giant and Winter Purslane, which I personally don’t think is bad going for well into November at this latitude. That all went with the lovely organic eggs from Clarice and Phyllis, and some halfway-decent inorganic tomatoes from Lidl now that ours are finished. Being the more conservative member of the household where greens are concerned (he means faddy – E), I stuck to my lettuce as usual. And seeing as how you’re obviously now anxious to know, that was followed by delicious bread buns made from home-ground organic spelt grain, yeast, water and salt, baked free of charge on top of the woodstove, with, in Elsie’s case, the stinky kipper fillets in something disgusting which she eats from time to time. Why she eats that stuff when she could eat good wholesome organic cheese like I do, I have no idea. I love to read your blog posts. They are always so informative, but also very entertaining and amusing! I love your writing style, it always makes me leave with a smile.